In September 2016, my neighbor and I took the plunge into doing Airbnb rentals, and we didn’t know the first thing about getting started. One of the first questions we had was how are we going to secure the house? Are we going to have to give a key to each visitor that came? In talking over our business venture with a good buddy who was already doing Airbnb, he suggested that we get an electric lock. I thought brilliant! He said that Amazon had a lot of great locks that were reasonably priced below $100, so to Amazon I went. After reading the reviews on a number of locks, we decided on the Schlage BE365VCAM619 Camelot Keypad Deadbolt, Satin Nickel, purchased it, and it arrived two days later. Right off the bat, I was extremely impressed with the quality, and the brushed nickel look of the lock. I could tell this was extremely well made, and solid. It had to be if it was going to protect our house! I really couldn’t think of much else to speak negatively on the electronic deadbolt. If you are thinking about becoming an Airbnb host or if you are thinking about having multiple tenants in your residence, then you won’t be displeased. It is a great alternative to providing a key to tenants, which can be easily duplicated. 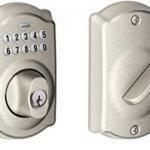 With this electronic deadbolt, you are able to create new codes and hand them out to each tenant. This allows you to keep your house secure, and will allow you to create codes for each specific tenant, and then delete them when they leave. Overall, you won’t want to look any other alternative to securing your house if you are Airbnb’ing your house! 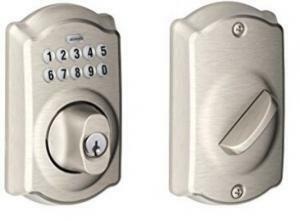 This deadbolt is so easy to use, and will provide you the comfort of knowing your house is secure! I’d be interested to know if you’ve purchased the Schlage deadbolt, or what alternative you are using to secure your Airbnb house? Please leave a comment below! I’d love to hear your thoughts or suggestions! TTG may receive a small commission if an item is purchased via the preceding links at no cost to you. Thanks for supporting our site. Will Opening Up a Bank or Credit Account to Earn Bonuses Hurt My Credit Score?